The smartest guy in the room isn’t always the one with the most expensive education. It’s the guy who strategizes. The guy who plots five or six moves ahead, considers every possible angle, and has a contingency for every eventuality. The guy who plans his career moves like a grandmaster plays chess, and succeeds accordingly. This is the man we all want to be and, with some forethought, can be. 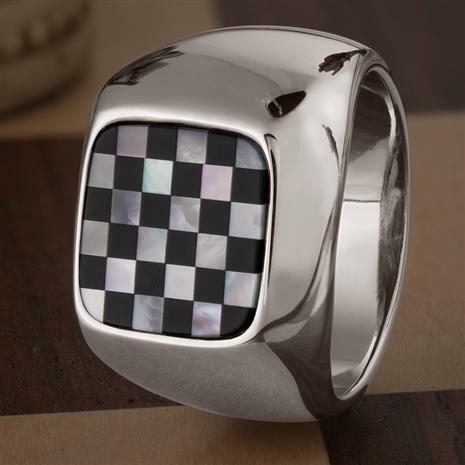 The Grandmaster Ring is a stunning .925 sterling silver men’s ring with a detailed chessboard design, made from ink black agate and iridescent mother-of-pearl. This logical-thinking luxury is affordably priced, so if you want some help in your next strategy session, we encourage you to plan ahead by ordering the Grandmaster Ring today. Don’t be a pawn in someone else’s game. Be the grandmaster.